she decided she was ready to meet this world. I knew there was a chance of complications, due to her being slightly premature, but after coming out of recovery and seeing the look on the doctors’ faces I knew there was a larger problem than low birth weight. They started using words with me I had never heard before, and all I really got out of the explanations was that she was going to be life flighted out of our hometown hospital to a larger NICU in Topeka, Kansas. I never got to hold her before she was loaded into that helicopter and taken away. After 5 days, I finally got to hold my little girl, and after 13 days in the NICU, I got to bring her home… with way more care than I ever could have imagined one child would take. Nine years later, Ashlynne is healthy, and happy. She has a form of ichthyosis called ichthyosis en confetti. She has a long bath and lotion routine each morning and night, and lotions several times throughout the day. She has physical therapy. We have to watch the heat, and I am in constant fear of a skin infection that I might not catch in time. It’s sometimes hard to explain ichthyosis, because when people hear Ashlynne has a skin disorder, they picture eczema or psoriasis. They don’t really understand how much this affects her. This affects EVERYTHING. It causes stiffness in her joints, due to her skin being tight, which causes her to move stiffly, and slowly. She can’t hear as well, because the skin builds up in her ears. She gets overheated easily, because she doesn’t sweat. Not to mention, the time that is lost out on playing and just doing kid things because she has to soak for so long in the bath tub at night, in addition to all of the time spent throughout the day applying lotions. She feels self-consciousness any time she goes out in public because people stare at her. Even with all of this, I wouldn’t change a thing. Do I wish I could take it away from her sometimes, or take her place? Yes. 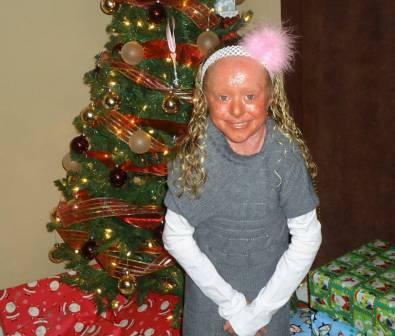 But Ashlynne’s ichthyosis does not define her. She is an absolutely beautiful child, inside and out. She has the funniest personality, a very mature, dry, sarcastic sense of humor, the most contagious smile, and a very kind heart. She loves animals and bugs, or anything “creepy” as she says, and scary movies. She just wants to do normal kid things, like swim, have sleepovers with her friends, and go shopping. She wants to be a veterinarian when she grows up, or a rapper. She wishes she could do all of these things without the stares that so often come when she is in a place where not very many people know her. However, with every stare, and whispered comment, comes a chance to educate and inspire one more person. And inspire she does. She is the strongest person I know. She has taught me about compassion, and patience, and perseverance. She has taught me more in the past 9 years than I could ever teach her. She has made me a better person, a better mom, and I am thankful every day that God trusted me to care for and love her. More than anything, in today’s very vain world, she has taught me the meaning of TRUE BEAUTY.